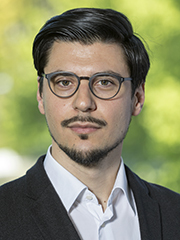 Dr. Ali Aslan Gümüsay is a postdoctoral DAAD Prime Fellow at Vienna University of Economics & Business and the Universität Hamburg. Before, he was a Lecturer at Magdalen College, University of Oxford and a DPhil Candidate at Saïd Business School, University of Oxford. Prior to this, Mr Gümüsay worked as a strategy consultant for the Boston Consulting Group. Dr. Ali Gümüsay’s work explores questions at the intersection of Organization Theory, Entrepreneurship, Business Ethics and Leadership. At the heart of his research are issues around people, organizations and societal values. It is guided by the general question: How do values and meaning shape organizations and how are they managed? Diel, K./Gründinger, W./Gümüşay, A.A.: "7 Virtues Reloaded", 1. Auflage, Vergangenheitsverlag Berlin 2013. Gümüsay, A. A., Smets, M., & Morris, T. ‘God at Work’: Engaging central & incompatible institutional logics through elastic hybridity. Academy of Management Journal, 2019. Gümüşay, A.A., & Bohné, T.M. 2018. Individual and organizational inhibitors to the development of entrepreneurial competencies in universities. Research Policy. 47:2, pp. 363-378. Gümüsay, A. A. “COMMENTARY: Sharing is caring: From material to socio-material sharing”, Academy of Management Discoveries, 2018. Gümüsay, A. A. "Unpacking entrepreneurial opportunities – an institutional logics perspective”, Innovation: Organization & Management, Vol. 20, Iss. 3, 2018, pp. 209-222. Gümüşay, A.A., Höllerer, M. A. & Meyer, R. E. “Organizational Scent”, M@n@gement, Vol. 21, Iss. 4, pp. 1424-1428, 2018. Gümüşay, A.A. "Embracing religions in moral theories of leadership”, Academy of Management Perspectives, 2018. Gümüsay, A. A. & Bohné, T. M. “Individual and organizational inhibitors to the development of entrepreneurial competencies in universities”, Research Policy, Vol. 47 Iss. 2, 2018, pp. 363-378. Gümüsay, A. A. "The potential for plurality and prevalence of the religious institutional logic”, Business & Society, 2018. Gümüsay, A.A. “The Role of Religions in Business", Bible & Liturgy, Vol. 90 Iss. 3, 2017 pp. 214-219. Gümüşay, A.A.: "Entrepreneurship from an Islamic Perspective", Journal of Business Ethics, Vol. 130 Iss. 1, 2015, pp. 199-208. Gümüşay, A.A.: "Knowledge & Boundaries in a Sufi Dhikr Circle", Journal of Management Development, Vol. 31 Iss. 10, 2012, pp. 1077-1089. Gümüşay, A.A. 2019. Religions and business in times of societal change, chapter in Mokrosch, R. & El Mallouki, H. (eds), Religions and global change, Kohlhammer. Gümüşay, A.A. 2018. Book review: The Society of Singularities by Andreas Reckwitz, Organization Studies, 39:10, pp. 1492-1495. Gümüşay, A.A. & Liebig, D.: Chapter in: Perspektive Unternehmensberatung, e-fellows.net 2012, 2013, 2014, 2015, 2016, 2017. Gümüşay, A.A.: "Entrepreneurship – an Islamic Perspective", in: Kozali, A./Salami, I./Thabti, S. (eds. ): Islamic Economic Law, Peter Lang Verlag 2015. Gümüşay, A.A.: "The Zahnräder Network", in: Rohe, M./Engin, H./Khorchide, M./Öszoy, Ö./Schmid, H. (eds): Handbook Christianity and Islam in Germany, Herder 2014, pp. 1236-1245. Gümüşay, A.A.: "The Role of Muslim Elites in Germany & Europe" in: Ceylan, R. (ed. ): Islam und Diaspora: Analysen zum muslimischen Leben in Deutschland aus historischer, rechtlicher sowie migrations- und religionssoziologischer Perspektive, Peter Lang Verlag 2012. Gümüşay, A.A.: Chapter in: Perspektive Unternehmensberatung, e-fellows.net 2008, 2009. Gümüşay, A.A. On Circularity, Organizational Boundaries & Institutional Entrepreneurship. Gümüşay, A.A. Engaging both religions and paradoxes in leadership, organizing and society. Gümüşay, A.A. On Institutional Logics. Gümüşay, A.A. Book Review: The Society of Singularities, Organization Studies, 2018. Gümüşay, A.A.: "Religion & Leadership – Ancient wisdom for a modern world? ", 2016, LEAD Research Study. Gümüşay, A.A.: Foreword, in: Ramadani, V./Dana, L.-P./Gërguri-Rashiti, S./Ratten, V. (eds. ): "Entrepreneurship and Management in an Islamic Context", 2016, Springer. Gümüşay, A.A. & Diel-Gligor, K.: "7 Virtues Reloaded", 2015, Hohe Luft philosophy magazine.